We all know that Kamen Rider EX-Aid has reached it mid-season with the debut of his newest super form, Kamen Rider EX-Aid Maximum Gamer Level 99 so let's start some new Rider series rumors starting with the "leaked" image above. 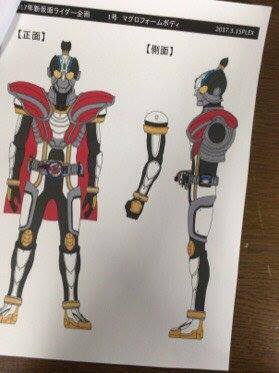 According to Kamen Rider news, the japanese text says "2017 New Kamen Rider Plan # 1 Maguro Form Body" and it also claims that it came from PLEX as seen in the title. As usual folks, take this with a grain of salt. Could we be having another Kamen Rider Gaim in our midst with this Edo period design after EX-Aid ends. YES! A Kamen Rider that looks cool again! The samurai theme is pretty cool. I wonder what the gimmick is going to be for this. I would love to see a Kamen Rider series based around a Martial Arts theme. The concept seems pretty neat in my opinion. I loved that game. I still have yet to play the other installments. Sushi Gaim? I'm totally down. I actually really hope this is real. Maguro is Japanese for tuna. This could be a lot like Gaim if it's samurai + food theme. I like it But Where's my Card Rider?? That armor looks like Ringo Arms ripoff. And if this true, nope. We're already have Gaim and Ghost (especially Musashi & Ryoma). No need for Sengoku themes anymore til phase 3 of Neo Heisei. The face looks humanoid. Similar to Kikaider and Metalder. Not a bad design and it is way better than Ex-Aid. Hey, that's from Phoenix Wright, am I right? We're getting another samurai-themed Rider? This one looks more like it's around Edo or Meiji design, so probably not another Sengoku Rider like Gaim or Musashi Soul Ghost. I'm reminded of the Xaido/Saido rumors from 2012. Anyone remember that one? The rider that had a transparent shuriken on his face, and ended up being Wizard? So maybe it's food or cooking themed rider. But I really wanna see ninja themed rider.. they have so many ninja sentai, why no rider? ?